Today’s featured composer/musician is Henry Thacker “Harry” Burleigh. 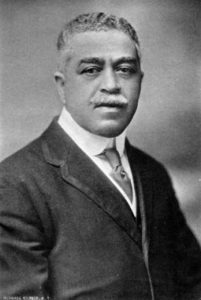 Harry Burleigh (1866-1949) is credited, more than anyone else, with making the Black American spiritual repertoire known throughout the United States and the world. A baritone himself, it is said that while Burleigh was a student at the National Conservatory in New York he was the one who inspired Dvorak’s “American” works by singing spirituals while he cleaned the building, a condition of his scholarship. Burleigh went on to arrange and later compose works for voice, becoming one of the premiere art song composers of his day. He helped to make Black music available to classically trained artists, both by introducing them to the music, and by arranging the music in a more classical form.